(Photo: REUTERS / KIM HONG-JI)South Korean President Park Geun-hye speaks to family members of missing passengers who were on South Korean ferry "Sewol," which sank at the sea off Jindo, during her visit to a gym where family members gathered, in Jindo April 17, 2014. SEOUL, May 19 (Reuters) - Tears rolling down her cheeks, South Korean President Park Geun-hye formally apologized on Monday for a ferry disaster that killed about 300 passengers, mostly school children, and said she would break up the coast guard for failing in its duties. Park has been hit hard by an angry nationwide outcry over the government's response to South Korea's worst civilian maritime disaster in 20 years and the seemingly slow and ineffective rescue operation. Polls show support for Park has dropped by more than 20 points since the April 16 disaster. "I apologize to the nation for the pain and suffering that everyone felt, as the president who should have been responsible for the safety and lives of the people," Park said in a televised national address, her first since the Sewol capsized and sank with 476 passengers and crew on board. She fought back sobs as she remembered some of the teenagers who perished trying to help one another, calling them heroes in an unprecedented show of emotion. Park, who is serving a single five-year term, is the daughter of Park Chung-hee, the former military strongman who ruled for nearly two decades in the 1960s and 1970s. She lost both her parents to assassins. At least 286 people were killed and 18 remain missing. Only 172 people were rescued, with the rest presumed to have drowned. Of the passengers, 339 were children and their teachers on a field trip from a high school on the outskirts of Seoul. Park vowed sweeping reforms to improve oversight, as well as tough punishment for bureaucrats and businesses whose negligence endangers public safety. "A 20-year-old vessel was bought and refurbished to add excessive capacity, then it was loaded with much more cargo than allowed with a false reporting on weight, but not a single person in the position to supervise stopped any of it," Park said. She singled out structural problems within the coast guard as the main reason why there was such a high casualty toll from an accident that played out on national television as the vessel gradually sank with most of the passengers trapped inside. "Had there been an immediate and proactive rescue operation after the accident, we would have been able to reduce the casualties," Park said. The coast guard's rescue duties would be transferred to a national emergency safety agency to be set up and the national police will take over its investigative function, she said. 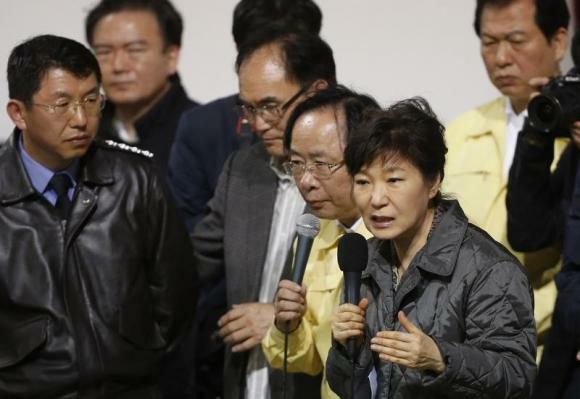 Park has apologized in person to many family members of the victims but her administration has faced continued criticism and nationwide anger for its handling of the disaster. Park's public support has dropped to 46 percent, from 70 percent before the accident, according to a recent poll. Her formal apology and the blueprint for bureaucratic reform have been criticised for coming too late, while her decision to break up the coast guard has also been questioned. "Although we need to integrate government functions on safety and disaster management, dissolving the coast guard all of sudden can make more problems that may be difficult to fix," said Professor Lee Jun-han of Incheon National University. Park said the coast guard had not only failed in its search and rescue duty but that, in its current form, it would be unable to prevent another large-scale disaster. "The coast guard continued to get bigger in size but did not have enough personnel and budget allocated for maritime safety, and training for rescue was very much insufficient," she said. All 15 surviving crew members were indicted last week, including the captain and three senior crew members on homicide charges. The remaining 11 crew were indicted for negligence. The prosecution says the ferry was structurally defective after a remodelling to add capacity and was massively overloaded with cargo. A sharp turn then caused it to list and capsize. The Sewol had been on a supposedly routine journey from the mainland port of Incheon south to the holiday island of Jeju.